Up Top Acres - founded by Kathleen and her co-founders Jeff Prost-Greene and Kristof Grina in 2014 - reimagines what a farm looks like. They grow food on rooftops and, in doing so, are converting neglected spaces into viable sources of income and environmental safeguards. The farms are also spaces for communities to interact with and learn about food, in order to establish agriculture as a fixture in city life. 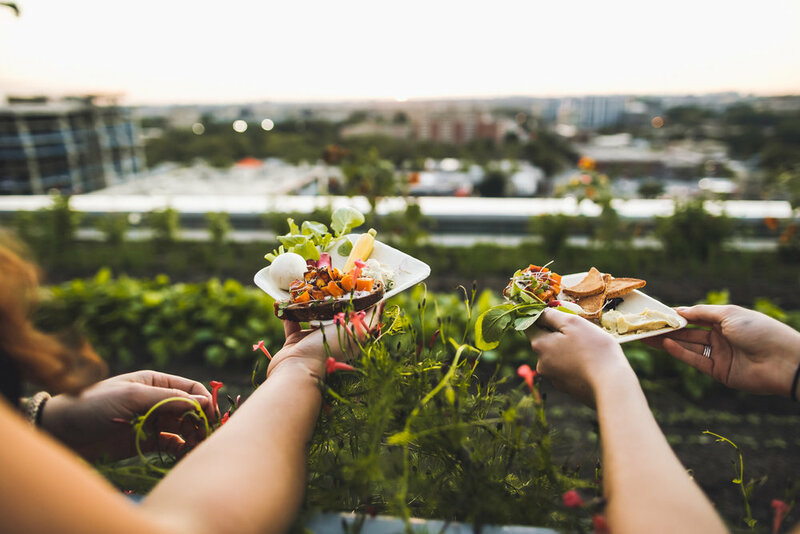 We sat down with Kathleen a few days after Dip n’ Dig, a Pineapple DC event co-hosted with Little Sesame and Up Top Acres at the Farm at 55 M St, to chat about the evolution of Up Top Acres and her journey as a female entrepreneur in the food world. All photos by Leah Beilhart. What was the insight that led to Up Top Acres? "Up Top Acres was started in 2014 by me, Jeff, and Kristof. We're all DC natives who met and became friends while attending DC public schools. We went off to college and returned to DC for jobs in our fields after graduation (I studied urban planning, Jeff was in business and social entrepreneurship, and Kristof in agriculture). None of us were quite satisfied in our jobs, and wanted to find a way to better our hometown. We coalesced around the idea of rooftop farming because of the myriad of benefits its brings-- from growing food where we live (70% of the world’s population will live in cities by 2050) to reducing the environmental impact of food transportation and creating a connection between agriculture and urban life. We looked to the rooftops because land in cities is expensive, the soil is often contaminated, and your investment can be wiped out quickly by development. Our rooftop farms are green roof systems at their base, and when we started, DC was already promoting green roofs on new developments so there was space for us to retrofit and work with. We launched in Fall 2014 and built our first farm in the Spring of 2015 in partnership with José Andrés and ThinkFoodGroup. We now run five farms that total over an acre of land. On one hand, Up Top Acres is an urban food supply solution but we are aware that we can't produce enough food alone to supply the city. So on the other hand, we are also a food education solution. Our farms are a way to connect people back to where their food comes from, and ultimately we think these interactions will shape their decisions around food in the future. How has your idea evolved over time? At first, we imagined one flagship farm of about an acre with an event space. It was difficult to find a space of that size and we’ve now moved to a model in which we’ll create a network of neighborhood farms around the city. These networks will allow for residents to feel connected to a certain farm, or group of farms in their neighborhood, but will also tie them to part of a larger local food system. What do you see as the future of food in DC and what is Up Top’s role in that? Imagine flying over DC and looking down and seeing a sea of green from above because you’re looking at a city that has rooftop farms atop every building. This has a few implications. The first, is that our definition of local will change. Local will no longer mean a distance of a hundred or more miles outside of the city but instead, a few flights of stairs. The second implication is that urban agriculture will be established as an industry. We decided to start Up Top Acres as a for-profit company to establish urban agriculture as a viable industry. The growth of rooftop farming, along with indoor farms, and on-the ground urban farms means that urban agriculture could become a viable industry in the future of DC food.The third implication is that there will be a clear connection between the farms and community space - especially in a city that is experiencing such rapid development. This would position rooftop farms as gathering spaces for educational and social events in each neighborhood. In this way, the farm is no longer a remote concept but rather something central to one’s place in the city. Why is a connection to food and where it comes from or how it’s made important? There are so many reasons. At a basic level, there have been studies linking the role of green space to positive mental health and improved quality of life. As an urban population, this is something we need to think about as the pace of city development accelerates. Another way to think about this is from the environmental perspective. Agriculture, and food production overall, is a large contributor to the environmental challenges we face. We must think about our food in connection to how it impacts the environment. For example, with Up Top Acres, we see the role of a green roof, especially one with a farm on it, as a necessary environmental intervention in a city with a combined sewer system. In a city like DC, there are not enough green spaces to absorb and capture this storm water and it ultimately mixes with sewage and is dumped into our local waterways, making them unswimmable and unfishable. What the farms do is act as a storm water catchment system, which allows us to use the space as productive land and helps prevent combined sewage overflow events which lead to sewage mixing into our rivers. A final reason is that food is a deeply intimate and personal part of our lives. There are consumption decisions associated with food that in aggregate, have powerful consequences for our impact on the planet and on our health. If we are able to more fully connect the consequences of our decisions as consumers with these broader outcomes, we might make different choices because of the connections we create while learning about our food. Can you share some observations of life as a female founder? For as long as I can remember, I’ve been a woman in a room filled with guys, so having two male cofounders is something I’m very comfortable with. I was also raised by a female entrepreneur and business owner, so I’ve grown up with a very strong working female presence. Having interacted with other female founders at Pineapple or other women in food events, I realized that I haven’t faced some of the same challenges that solo women founders do, and I think a part of that is because I am often with one of my male cofounders.That being said, I will add that I’ve experienced certain situations in which someone will only address my male co-founders even though we are both in the meeting But in general, having male and female co-founders has been a major plus for us-- cofounders not only make the quest of entrepreneurship less lonely, but we get different viewpoints on every decision and scenario we face. What do you see as the role of women in food and what role can women in food groups (like Pineapple DC) play in creating this future? I don’t think there’s one specific way in which women can contribute to the food industry and its future, but I do think women in food groups are valuable. Ultimately, food brings people together and thus, is a way to create community. This is what women in food groups, like Pineapple DC, do -- they create spaces for us to build community, to create a support system, to combat isolation and to integrate our work. Often times we get siloed in our jobs and don't have the chance to overlap with people who have similar interests but different backgrounds. Groups like Pineapple allow you to engage with this community, and create innovative ideas on how to collaborate together. A theme that has emerged from our pineapple events has been the connection of wellness and self-care in ensuring the space and vitality required to do the work we do. Can you share some of the more personal mental roadblocks that you have worked through or are working through as a female entrepreneur? The biggest thing was to stop second guessing myself. I came from a very structured childhood and background - I was going to go to college, get a job. I was a rower, so even the sport I participated in was the one with the most structured ones you could pick, with someone telling you exactly when to do what. Entrepreneurship is the opposite of that. Being an entrepreneur means having no roadmap or clear pathway to success, We are defining it as we go and with that comes a lot of uncertainty about whether what I am doing is the right thing to do. I have to remember that I am creating this future and so I won’t know if it was right or wrong until later. And ultimately, a wrong decision turns out to be just as valuable as a right one because I’ve learned from it for the future. This is also what makes this path so exciting and fun. What do you want the pineapple community to know? There is always a way forward. Things can seem really overwhelming and uncertain a lot of the time. But a sense of passion and commitment means that we will always find ways around the roadblocks because we’re committed to figuring out a way forward. A lot of time this comes with asking for help, which is another reason why communities like Pineapple are so valuable.